Current and future astronomical survey facilities provide a remarkably rich opportunity for transient astronomy, combining unprecedented fields of view with high sensitivity and the ability to access previously unexplored wavelength regimes. This is particularly true of LOFAR, a recently-commissioned, low-frequency radio interferometer, based in the Netherlands and with stations across Europe. The identification of and response to transients is one of LOFAR’s key science goals. However, the large data volumes which LOFAR produces, combined with the scientific requirement for rapid response, make automation essential. To support this, we have developed the LOFAR Transients Pipeline, or TraP. The TraP ingests multi-frequency image data from LOFAR or other instruments and searches it for transients and variables, providing automatic alerts of significant detections and populating a lightcurve database for further analysis by astronomers. Here, we discuss the scientific goals of the TraP and how it has been designed to meet them. We describe its implementation, including both the algorithms adopted to maximize performance as well as the development methodology used to ensure it is robust and reliable, particularly in the presence of artefacts typical of radio astronomy imaging. 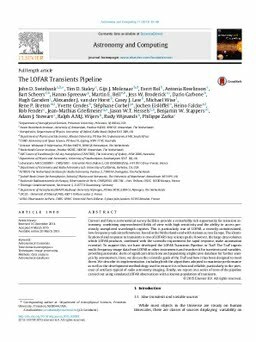 Finally, we report on a series of tests of the pipeline carried out using simulated LOFAR observations with a known population of transients.